Aviary is one of the best photo-editing apps on iOS, but there’s a huge number of users who like to share their final images on Instagram. After all, it’s arguably the biggest and most active cross-platform photo-sharing community around at the moment. So rather than go through the somewhat arduous process of saving the edited photo to the Camera Roll and then finding it again inside Instagram, Aviary has simply updated its iOS app to pair the two. While browsing through the gallery in Aviary, a dedicated Instagram button can now be accessed by tapping the share button in the top right-hand corner of the screen. It won’t post to the user’s profile straight away though – because photos saved to Aviary can be shot in the traditional 4:3 image format, Instagram will require the user to choose a square crop first. Nevertheless, it’s a welcome shortcut for Aviary users and a more viable proposition for Instagram fanatics. Given that Facebook’s photo-sharing app only supports a dozen or so retro-inspired filters, it’s a good way of creating some fresh effects and applying some basic brightness, contrast and saturation tweaks. In recent weeks Aviary has also been busy producing new filter packs, some of which have been produced in collaboration with professional photographers. Wanderlust, released last week and designed by Sara Milton to improve travel shots, is worth checking out in particular. 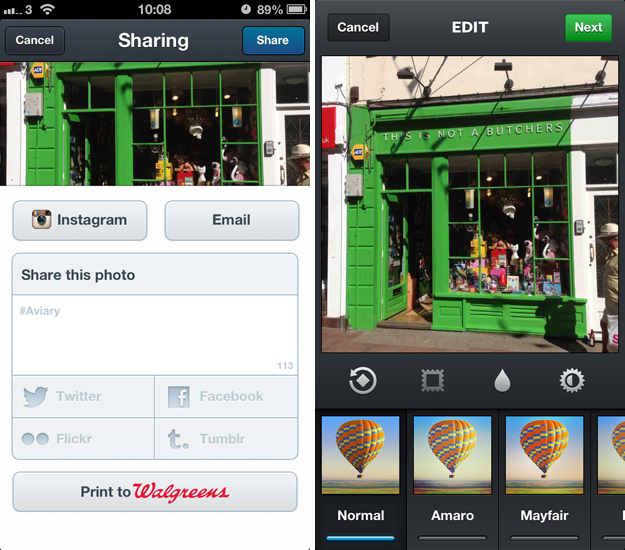 The updated Aviary app is available in the App Store right now. The direct sharing to Instagram doesn’t appear to be in the Android version just yet, but we’ve reached out to the app’s creators to see if it’s on the cards.